We’d love your help. Let us know what’s wrong with this preview of The Hand That First Held Mine by Maggie O'Farrell. A spellbinding novel of two women connected across fifty years by art, love, betrayals, secrets, and motherhood. Hedged in by her parents' genteel country life, she plans her escape to London. There, she takes up with Innes Kent, a magazine editor who wears duck-egg blue ties and introduces her to the thrilling, A spellbinding novel of two women connected across fifty years by art, love, betrayals, secrets, and motherhood. To ask other readers questions about The Hand That First Held Mine, please sign up. And so, I was lost to these words, lost and found in another place in time, which took my breath away. Having just read her ”The Vanishing Act of Esme Lennox” mere days ago, which also swept me into her story from the start, I’m once again in awe of her skills as a writer. Not only her ability to craft lovely sentences, paragraphs, but her ability to weave together two stories that join together with such perfection that I am in awe. Alexandra, or Sandra as her mother calls her (a nickname she detests) will eventually go by “Lexie,” a nickname given her by a man she has not met quite yet. She is twenty-one as this begins, and eager for life beyond the four walls of her parents house, and the small life she has living on this country lane. Innes Kent is just down the road from her at this moment, a thirty-four year old man, an art dealer and journalist, and many more things – but the one thing he is not is a car mechanic – which would certainly come in handy now that his car, a silver and ice-blue MG, has broken down. It is later on, in 1950’s London is where this story really begins, in and around Soho, and I wandered through these streets with Lexie as she slowly learns what she wants from this life. An alternating storyline that takes place some fifty or so years later, where we follow the lives of Elina and Ted, which weaves through this book, as well. It all is so seamless that it doesn’t feel disruptive, with transitions that seem effortless and natural. Many of my friends have read and loved her books, Angela, and Betsy come to mind quickly, as well as Debbie (and her pogo stick), who hasn’t read this one, yet, but has become a fan. Angela’s review for This Must Be the Place was the one I remember wanting to read first, but I’ve read these in the order my library has them available for me – and I’m not complaining! I hate to leave this one behind, but I hear others calling me. Edited to make correction. Originally read Aug, 25, 2014. I loved this novel mostly because of the writing. Yes, I loved the story and the characters too, but from the exquisite opening paragraph it was all about the writing. Something amazing doe Edited to make correction. Originally read Aug, 25, 2014. Something amazing does happen to Lexie and Innes, the characters we first meet. Something happened to this reader, as well. I found myself so immersed in the language and the story to come, from these first words to the very last. It's told with these seemingly simple sentences that are strung together so beautifully to describe the places where they are and to take you into the minds and hearts of these characters. Maggie O'Farrell opens up to us the London of the 1950's - the arts scene in Soho and you feel as if you are in that city and in that magazine office with Lexie and Innes and you are privy to their aspirations for its success and privy to the profound love they share. Fifty years later we meet Elina and Ted, a couple struggling to come to terms with becoming parents. Elina, after an extremely difficult, life threatening childbirth experience seems lost. You experience her pain and her exhaustion and her helplessness .Ted is having a difficult time both emotionally and mentally, even physically, trying to remember something from his past and you can almost feel his pain. So many recent books tell past and present stories that are somehow linked. The alternating narratives of Lexie & Innes and Elina and Ted are also connected, but the convergence of these stories, felt different, smoother, more skillfully and beautifully achieved than any other book using this mechanism that I have read. Maybe it was the story itself that touched me or maybe it was all about the detailed poetic language. Maybe it was both. I can only say that I was deeply touched by these characters and their story. One of my favorites of the year so far. This writer, this Maggie O’Farrell, just wow. I’ve never read five books by any writer before (and I did this all within a year--what??). That should give you a hint of how ga-ga I am over Maggie dearest. Can I call her Maggie, please, as if we’re all chummy chummy, since I want to be? What did I like about this book? Well, just about everything. It is 100 percent absorbing. It has the required good characters, plot, and pacing. The characters have depth and they’re relatable. And is it really me talking when I say her descriptions are fantastic? If you know me, you probably know that scenery is often a hot item on my Complaint Board. I never ever require scenery. I’ve had my fill of raindrops on a maple leaf, thank you very much. But Maggie seduces me with how she uses her pen as a paintbrush. With just a few quick, and what seem to be effortless, strokes, she sits her characters down into a space that’s so vivid it makes my head happy. There! I visualize the London settings perfectly, and I didn’t even have to jump through head hoops to see it! But take all of the list of good qualities and add an item to the top, and that’s the beauteous language, which mesmerized me because of its art but also because it stirred me up and made me feel for her characters. THAT’S what keeps me gushing. Two stories take turns. One is about Lexie, who escapes a boring rural life and finds herself in the Bohemian scene of 1950s London. She falls in love, and I think it’s that rich relationship I’ll remember the most about this book. The other story takes place 50 years later. It’s about a new mother Elina, who lives with her boyfriend, Ted—both are angsty, but for different reasons. The book is about love—both romantic and maternal--and the intricacies of relationships. And it’s about grief, jealousy, and memory. It’s a long time before you see how the two stories are related, but when the connection is revealed, it’s a humdinger. Oh so cool and satisfying. I have to add two other good things to the list. I like how Maggie foreshadows. I think some people get annoyed when they learn early on that something dramatic is going to happen, like why did you have to go and ruin the surprise? But I usually see it as artful; it adds suspense because you don’t yet know how it’s all going to go down. In this book, I loved the foreshadow, the tease, and I thought I had it figured out—but no way. The other good thing is that O’Farrell makes amazing, seamless transitions. No matter how often she switched scenes, I was not confused, and I was happy to be where I landed. I see that all I can do is gush, so I might as well stop. You’ve heard one gush, you’ve heard them all. But I can’t help myself: let me just end by saying I think Maggie O’Farrell is the perfect storyteller. She is pure story: she is never preachy, she doesn’t take you on unnecessary side-trips, she doesn’t go all philosophical, and her endings are satisfying. One of my favorite authors, hands down. Any fiction novel which follows the five or six literary fiction novels I have just finished may well have big shoes to fill but The Hand That First Held Mine held it's own. I do so love it when an author combines combines real people into their story. After reading this novel, I half expect if I pore over the photographs by John Deakin I shall find images of Lexie and Innes. And likewise, if I go to Soho, I shall find on Bayton Street the faded chalk writing of the word elsewhere in front of th Any fiction novel which follows the five or six literary fiction novels I have just finished may well have big shoes to fill but The Hand That First Held Mine held it's own. I do so love it when an author combines combines real people into their story. After reading this novel, I half expect if I pore over the photographs by John Deakin I shall find images of Lexie and Innes. And likewise, if I go to Soho, I shall find on Bayton Street the faded chalk writing of the word elsewhere in front of the building where Innes' magazine was housed. Indeed, the line between fact and fiction is blurred even more when you realise that one of Deakin's photographs is used for the cover of the book. I actually spent the whole of the novel wondering if it was really Lexie pictured there as the caption is simply Girl in Cafe. Also featured from 1960s Soho is the famed Colony Room http://en.wikipedia.org/wiki/The_Colo... owned by Muriel Belcher, an autocratic and temperamental woman who also appears in the story. Such is the gift of Maggie O'Farrell: she has an incredible talent of weaving fact with fiction; she makes the whole story very personable. She did so in The Vanishing Act of Esme Lennox; unmanageable daughters were indeed sent into convents/homes and simply disappeared from families in the early 1900s. And she does so in The Hand That First Held Mine. This novel opens in Devon, mid 1950s, with a chance meeting between Lexie and a Londoner called Innes. Forward a few months and Lexie has traveled to London, reconnected with Innes, the proprietor of the magazine 'elsewhere', become his fledgling reporter and his lover. It's the bohemian art scene and under Innes' tutelage, Lexie soon carves out a niche for herself as an art critic. Forward some 50 years and young couple Ted and Elina are new parents. While Elina struggles with first time motherhood, it's Ted's whose life is really wavering. The strange almost trance-like moments he had as a child have returned. He's subject to odd memories that appear to have nothing to do with his early life as he knows it and they start to occur fairly frequently. Oh no, another favourite author releasing a new title – cue the sickening feelings of anxiety when I settle into the story , wondering if it will meet my expectations but any fears are quickly assuaged as I become immersed in this, Maggie O’ Farrell’s fifth novel. I devoured it in a few sittings – one of those books you are eager to embrace but loath to leave. Like it’s predecessor, The Vanishing Act of Esme Lennox, there is a cleverly woven dual narrative, one set in the 1950s/1960s in Bohemian Oh no, another favourite author releasing a new title – cue the sickening feelings of anxiety when I settle into the story , wondering if it will meet my expectations but any fears are quickly assuaged as I become immersed in this, Maggie O’ Farrell’s fifth novel. I devoured it in a few sittings – one of those books you are eager to embrace but loath to leave. Like it’s predecessor, The Vanishing Act of Esme Lennox, there is a cleverly woven dual narrative, one set in the 1950s/1960s in Bohemian London and the contemporary story, again set in London. In the 50s setting, Lexie leaves the bucolic setting of her family home in Devon at the tender age of 21, intent on finding a new life in London. She meets and is seduced by Innes Kent, a seemingly most unsuitable partner and they fall for each other, working together on a magazine in Soho. From an, at times, irritating ingenue Lexie develops into a strong, independent woman working her way up in the male dominated sector of journalism. It’s fair to say that life does not treat her that kindly – she becomes a single mother without any family support, her family disowns her when she takes up with Innes. The modern day story focuses on Elina, a Finnish painter who lives with her partner, Ted. When we first encounter Elina she seems to be suffering some sort of post-traumatic disorder following a particuarly harrowing emergency caesarean birth and to begin with, motherhood does not sit very well with her especially as she seems to have blotted out all memories of giving birth. Later, Ted is the one to suffer flashbacks of suppressed memories and you start to wonder if this couple can withstand the immediate changes brought to the dynamic of their relationship by the arrival of the Baby. I must say, it’s refreshing to see a novelist showing how new parenthood can cause a seismic shift in a partnership – it doesn’t matter what class you are, how old you are, being a parent makes you feel more vulnerable. There is a link between these two stories, a connection which gradually reveals itself as the novel progresses with a series of teasing hints and clues sprinkled in the narrative. However, I feel that the bridge between the two stories is less important than the common themes which colour both – there is love, romantic love, platonic love, maternal love, paternal love, infatuation, passion, contentment in another’s company. There is loss and grief and how we deal with such facts of life. There is the recurrent motif of family secrets and lies which can cloud future generations. Maggie O’ Farrell is an expert at portraying well rounded, feisty female characters but here she also succeeds in capturing a very strong sense of male sensibilities via Ted and also Innes. It certainly serves to create a more balanced storyline to have both male and female perspectives, especially how the different male characters react to fatherhood. It’s clear that Maggie O’ Farrell has done her research – I could sense the sounds, sights and smells of 50s Soho and in the modern day setting, I could empathise with the trauma of an emergency caesarean and the slightly surreal atmosphere which accompanies the arrival of your first child. She has a lightness of touch which tempers the research and lets the narrative flow. Yes, it’s a novel which deals with a lot of sadness and grief but there is a feeling of optimism, of looking ahead also which lifts it from the doldrums. So, not that I’m impatient but….when will we get the next novel? I don’t think I can wait another four years…. This book left me breathless, gulping, and sobbing. Maggie O’Farrell is a master—of story, structure, and my god, transitions! But that is stuff writers swoon over. For readers there is a great story of family connections that transcend known facts. It’s about the truths we intuit and how they can nag, direct, and torture us until we bring them into consciousness and the now. A wonderful book! By the way, the Kindle edition also has a wonderful short story called “The House I Live In”—an appropri This book left me breathless, gulping, and sobbing. Maggie O’Farrell is a master—of story, structure, and my god, transitions! But that is stuff writers swoon over. For readers there is a great story of family connections that transcend known facts. It’s about the truths we intuit and how they can nag, direct, and torture us until we bring them into consciousness and the now. A wonderful book! In sneltreinvaart uitgelezen...twee verhalen die met elkaar verbonden zijn in heden en verleden. Soms ietwat quasi intellectueel, maar zo goed geschreven dat je meegetrokken wordt in het verhaal en alleen maar door wil lezen...Relatie's en moederschap zijn de overheersende thema's...prachtige roman!! Although choosing a favourite author is tough, when forced to do so I would more often than not, answer with Maggie O'Farrell as mine. I find her style of writing beautiful, almost melodic and so incredibley descriptive and evocative of the senses that you really feel like you step into the world of the characters whilst reading. However, this was based on her first three books, and I have to say that despite being SO excited for the release of 'The Vanishing Act of Esme May' (only book I've ever Although choosing a favourite author is tough, when forced to do so I would more often than not, answer with Maggie O'Farrell as mine. I find her style of writing beautiful, almost melodic and so incredibley descriptive and evocative of the senses that you really feel like you step into the world of the characters whilst reading. However, this was based on her first three books, and I have to say that despite being SO excited for the release of 'The Vanishing Act of Esme May' (only book I've ever pre-ordered!) I wasn't as enthralled as I'd hoped. In fact I was quite disappointed afterwards. Now with the release of 'The Hand That First Held Mine' it feels like Maggie O'Farrell has conciously changed paths as an author, now prefering to write historical fiction based in past worlds and decades. I totally respect her decision to do this but personally, I feel she has lost the edge and suspense and pase her previous books had. As I said, Maggie O'Farrell writes poetically and this book is no different. The book is also incredibly realistic and well researched; from the descriptions of bustling Soho to the uncomfortable rawness of how parenthood can be intensely wonderful but also twist and challenge lives and relationships. The book taps into an obsession of mine which is thinking about what buildings were in previous incarnations before my lifetime in London, and what they would have looked like and everything that happened in them and on the roads outside. I love thinking about who walked down the same streets as me and what they were doing and wearing and thinking. Maggie O'Farrell writes this into the book beautifully. However the reason this isn't a 5* review is just that I felt the storylines were slightly predictable and clumsy in parts. Shock occurances leap from nowhere in places and then nothing happens for chapter after chapter. In particular I felt Elinas storyline very repetative and sluggish, compared to Lexis vibrant almost too drama-packed life. I'm sure this juxtaposition was intended but I felt it really jarred sometimes and I'd be tempted to flick past Elinas sections to get back to the 1950s. I would definitely recommend this book for reading, as it's another high quality book from an extremely talented author, but I would also say if you've never read a Maggie O'Farrell novel that it'd be better to start with The Distance Between or My Lovers Lover which I consider up there in my favourite ever books. Mi primer acercamiento a Maggie O’Farrell no ha podido ser mejor, me ha encantado. 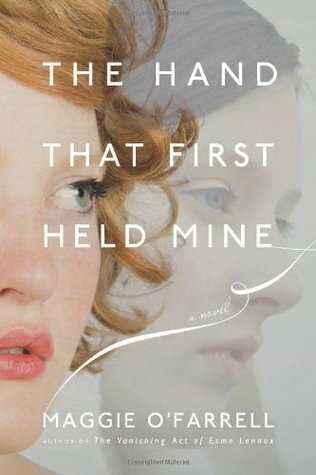 ‘The Hand That First Held Mine’ (2010) is Maggie O’Farrell’s poetic, extremely moving and very human story of memory, motherhood and emotions. O’Farrell tells us the stories of two couples – Lexie and Innes, in the 1950s and Ted and Elina in the present day – both with a London setting and both stories linked. ‘First Held Mine’ is a novel which is very up close and personal and unflinchingly so. It’s a story ostensibly about relationships; family and memory (distorted or otherwise) providing a h ‘The Hand That First Held Mine’ (2010) is Maggie O’Farrell’s poetic, extremely moving and very human story of memory, motherhood and emotions. O’Farrell tells us the stories of two couples – Lexie and Innes, in the 1950s and Ted and Elina in the present day – both with a London setting and both stories linked. ‘First Held Mine’ is a novel which is very up close and personal and unflinchingly so. It’s a story ostensibly about relationships; family and memory (distorted or otherwise) providing a heady mix of birth and death, love and hate, truth and lies. O’Farrell has written a well-constructed novel, with well-drawn and believable characters, which is certainly engaging and very compelling. Whilst O’Farrell’s novels may not be considered ostensibly perhaps very ‘literary’ in some circles – ‘First Held Mine’ is a deceptively simply, yet poetically told story and is none the less satisfying for that. This book is so hard to quantify with stars, because although I hated it for the majority, I have to admit that there were definite moments of genius. I can recognize what she was attempting here – there’s a slow, poetic, visual quality to the writing that sometimes succeeds. I can appreciate this type of novel (huge Michael Cunningham fan here) when it’s done with substantial emotion and poignancy and when the words are stunning enough in themselves to negate the absolute need for a concrete pl This book is so hard to quantify with stars, because although I hated it for the majority, I have to admit that there were definite moments of genius. I can recognize what she was attempting here – there’s a slow, poetic, visual quality to the writing that sometimes succeeds. I can appreciate this type of novel (huge Michael Cunningham fan here) when it’s done with substantial emotion and poignancy and when the words are stunning enough in themselves to negate the absolute need for a concrete plot. But, I never felt swept up in this book. To be honest, I was quite bored for most of it. The story follows two eras – 1950’s bohemian London, and present day London. Alexandra is a country girl. She’s recently been expelled from University for insubordination, and yearns to live a larger, freer life. When Innes Kent blows in to her small town with eccentric clothes and a shiny car, she decides to move to London. There, she changes her name to Lexie on his recommendation, and starts a whole new adventurous way of life. I actually really loved her transition to capable, confident woman. She strictly follows her own code, even when it’s socially improper. Meanwhile, in present day London, Elina and Ted are going through all the stress and insanity that comes with the birth of a first child. Elina, then Ted each go through strange memory lapses. Ted starts to recover memories that he has repressed since childhood. The present day story line is just so much less exciting than the 1950’s story line (and actually, that’s not all that exciting either). The hard thing is, I can see exactly what she’s trying to say. She conveys, quite accurately, the crazy, drained, sleep-deprived state that takes hold after the birth of a baby. I actually felt trapped, frustrated, and angry while reading those parts – which was utterly horrible, but maybe that’s what she was going for. Ted and Elina tip-toe around each other, evading every question, insisting constantly that they are “fine,” even while they both are falling apart. I wanted to strangle both of them throughout. There’s a part of the 1950’s story where Lexie nearly hits another character and says, “are you being willfully obtuse?” That’s exactly what I wanted to say to Ted and Elina. I really wanted to shake Elina in the beginning, when she stubbornly refuses all help and insists on caring for her newborn son alone, the day after she’s almost died, and even as she’s passing out three or four times in a day. He finds himself looking forward to a time when he and this child can walk together and discuss the visual effect of early morning sun on dew, the astonishing number of people out jogging and dog-walking at this ungodly hour, the way you can already see that the day is already going to be a hot one. I guess, taken all alone this passage really doesn’t seem too bad. But, for an author whose main focus seems to be words and lyricism, this feels very bland. It’s almost like the literary equivalent of stock-footage. Like, “what does everyone picture when going to a park?” Insert words here. An entire book filled with this kind of mild, tasteless wording really ended up bleaching most of the feeling that I could have experienced from the story itself. The plot suffers from far too much foreshadowing. She states at least twice, and early in the book, that one of the characters is not going to make it. When the inevitable occurred, there was absolutely no shock or emotional punch for me. The “twist” was insinuated at so blatantly that the last third of the book seemed like a foregone conclusion. I felt like there was no need for me to even finish reading. I can definitely see that Maggie O'Farrell is a talented writer. There's a strong possibility that I may give one of her other novels a chance before throwing in the towel. I can see what she was going for here, but I don't think that it was quite achieved. Having recently read The Vanishing Act of Esme Lennox and loved it, I was eager to read another book by Maggie O'Farrell and the blurb of The hand that first held mine had me intrigued. Fresh out of university and in disgrace, Lexie Sinclair is waiting for life to begin when the sophisticated Innes Kent turns up on her doorstep in rural Devon. In the present Ted and Elina no longer recognise their lives after the arrival of their first child. Elina an artist wonders if she will ever paint again w Having recently read The Vanishing Act of Esme Lennox and loved it, I was eager to read another book by Maggie O'Farrell and the blurb of The hand that first held mine had me intrigued. Fresh out of university and in disgrace, Lexie Sinclair is waiting for life to begin when the sophisticated Innes Kent turns up on her doorstep in rural Devon. In the present Ted and Elina no longer recognise their lives after the arrival of their first child. Elina an artist wonders if she will ever paint again while Ted is disturbed by memories of his own childhood - memories that don’t tally with his parents version of events. Maggie Farrell is a wonderful, descriptive writer, who really draws you into her stories with her beautiful imaginative writing. This story has a very haunting quality that comes from O’Farrell’s writing. It gives the book the atmosphere of a mystery, even though that isn't necessarily the main focus of the plot. Her prose is beautiful and imaginative. The novel is set in post-war 50/60s (not my favourite time to read about)London and also set in the present day. I did not find myself drawn into this time frame as I just could not get a sense of London in the 50s from the book although the descriptions are well written. I found the first 100 pages were a struggle as very little seemed to happen and it was not until halfway through the book that I started to enjoy the novel. although I had mixed feelings about this book I am a fan of Maggie O Farrell and look forward to reading more of her novels as I really think she has a unique style. The plot was interesting, but it moved too slowly for me. More than 100 pages in, and it was still not clear how the two different story lines were related. The author also spends a lot of time on the descriptions of the characters' surroundings, which I found annoying. They were too long, often unnecessary, and they kept the story from progressing. (Do I really need to know every time the baby arches his back to look up at the ceiling? That there was pannini bread on the floor of the coffee sho The plot was interesting, but it moved too slowly for me. More than 100 pages in, and it was still not clear how the two different story lines were related. I like that O'Farrell created buildings and landmarks that were (unbeknownst to the characters) shared by the characters from the past and present. Maggie O’farrell tiene una forma especial de describir sentimientos, personas, situaciones. Me ha encantado su forma de narrar historias. Leeré más obras suyas sin duda. O’Farrell’s novel could easily have turned out as a mawkish romance, but is exquisite instead. This is ‘serious literary fiction,’ and won a Costa Best Novel award to prove it. The descriptive language is elegant and precise, with just the right number of words and images to create a mental picture of a lawn in Devon with laundry flapping on a line, or the cracked tiles of the entryway of a London row house. Most of the book is in the present tense, which lends it immediacy and reality. Moreover O’Farrell’s novel could easily have turned out as a mawkish romance, but is exquisite instead. This is ‘serious literary fiction,’ and won a Costa Best Novel award to prove it. The descriptive language is elegant and precise, with just the right number of words and images to create a mental picture of a lawn in Devon with laundry flapping on a line, or the cracked tiles of the entryway of a London row house. Most of the book is in the present tense, which lends it immediacy and reality. Moreover, the novel welcomes the reader in as a confidant and active participant by starting chapters with “Listen” or “Look” or “Here is Lexie”. There are two intertwining stories; in the first half of the novel we have chapters alternating Lexie’s life in the 1950s and Elina’s in the present day. In the middle the two narratives meet with Ted’s visits to the café on the site of the old elsewhere office, and in the latter half we learn about how the stories are connected. Lexie is a feisty university dropout in Devon, dreaming of a bigger life. By chance she meets Innes Kent, a dapper and intriguing Londoner who takes her back with him into his bohemian world of free love and modern art. Meanwhile, Elina and Ted are coping with the after-effects of a traumatic birth plus all the disorientation (verging on madness) and sleep deprivation that come with having a new baby. I predicted early on that we would learn (view spoiler)[Ted was Lexie’s son (hide spoiler)], but hadn’t worked out exactly how, and I in no way saw the main tragedies coming (view spoiler)[(Innes’s and Lexie’s deaths, Margot’s revenge) (hide spoiler)], which is a mark of O’Farrell’s skill in plotting. Dos historias (una bastante mejor que otra) que se entrelazan de una forma magistral. Sinceramente odié la parte en la que Elina no se aclara con eso de ser madre, me ponía francamente nerviosa y no la comprendí para nada en el total de la novela. Para compensarlo me enamoré completamente de Lexie e Innes. 4.5 stars. This author doesn't disappoint! She knows how to concisely convey her characters' feelings and motivations to the reader. For example, young motherhood and a colicky baby - she communicates this perfectly, making me (once again) glad I'm menopausal. Oh, how she brought everything back! Very hard to function on little sleep. But I digress. There are two story lines in this novel. One is present day, one is historical, and eventually they intertwine. Yes, even though you think they neve 4.5 stars. This author doesn't disappoint! She knows how to concisely convey her characters' feelings and motivations to the reader. For example, young motherhood and a colicky baby - she communicates this perfectly, making me (once again) glad I'm menopausal. Oh, how she brought everything back! Very hard to function on little sleep. But I digress. There are two story lines in this novel. One is present day, one is historical, and eventually they intertwine. Yes, even though you think they never will, they do, round about the halfway mark. It's about familial relationships, the bond of friendship, marriage, motherhood/parenting, journalism, and art. Just before the halfway mark, it became very hard to put it down, and I found the ending to be a perfect way to end the story. I had read The Vanishing Act of Esme Lennox prior, and that was a five-star read all the way, for me. This one brought the exhaustion of a young mother to such reality that for me, it was hard to read at times. So I downgraded it, but only a bit, and this may not bother you at all. Esme was wonderful. As for the audio, it wasn't terrible but anytime the word "her" (and other, common words ending in r) was placed at the end of a sentence or phrase, the reader drew it out dramatically and that got very, very old quickly for me. I usually prefer the audio to having to sit and read (which doesn't allow multitasking), but in this case, I was wishing I had more time to read the physical book. “Listen. The trees in this story are stirring, trembling, readjusting themselves. A breeze is coming in gusts off the sea, and it is almost as if the trees know, in their restlessness, in their head-tossing impatience, that something is about to happen. The garden is empty; the patio deserted, save for some pots with geraniums and delphiniums shuddering in the wind. A bench stands on the lawn, two chairs politely facing away from it. A bicycle is propped up against the house but its pedals are s “Listen. The trees in this story are stirring, trembling, readjusting themselves. A breeze is coming in gusts off the sea, and it is almost as if the trees know, in their restlessness, in their head-tossing impatience, that something is about to happen. The garden is empty; the patio deserted, save for some pots with geraniums and delphiniums shuddering in the wind. A bench stands on the lawn, two chairs politely facing away from it. A bicycle is propped up against the house but its pedals are stationary, the oiled chain motionless. A baby has been put out to sleep in a pram and it lies inside its stiff cocoon of blankets, eyes obligingly shut tight. A seagull hangs in the sky above and even that is single, beak closed, wings outstretched to catch the high thermal draughts. The house is set apart from the rest of the village, behind dense hedge on the crest of a cliff. This is the border between Devon and Cornwall, where the two counties crouch, eyeing each other. It is a much-disputed piece of land. It would not do to look to long at the soil her, soaked as it will be with the blood of Celts, Anglo-Saxons, Romans, filled out with the rubble of their bones. I could go on and on, reading and typing, reading in typing. There is something about Maggie O’Farrell’s writing that I have loved ever since I read her first novel, some years ago now. Every word is perfectly chosen, every sentence is perfectly constructed. She paints wonderful pictures. Stills, and moving images too. Wonderful stories and moments captured, emotions vivid and pitch-perfect. I was so swept away that I didn’t even notice that the story unfolded in the present tense …..
My sky-high expectations, after reading so much praise for this book before I picked it, were more than met. Two stories are wound together through the Hand That First Held Mine. The first belongs to Lexie. Lexie has been sent down from university, back to her family home in the Devon countryside When she spots journalist Innes Kent watching her over the garden wall she seizes the chance to escape. Lexie plunges into a love affair, into the bohemian London of the 1950s, and she thrives. I was swept away by Lexie’s story. Such wonderful pictures were painted, such a wonderful range of vivid emotions was evoked. And eventually my heart would break for Lexie. The omniscient narrator’s voice was wonderful, but how I wished that things could have been different. The other story set in the present day is of Elina, who is struggling with motherhood after a very difficult birth. A more difficult story to watch unfolding, but it is quietly compelling nonetheless. And of her husband Ted, Ted worries about Elina and the baby, and then he begins to have blackouts. The birth of his child brought memories of his own childhood to the surface. Memories that he struggles to understand. He remembers a lovely woman holding his hand, smiling, laughing. But he doesn’t know who she was. As Ted searches for answers, the twin story lines merge. The links are not difficult to work out, but that doesn’t matter. The two stories and their union, are perfectly constructed and the resolution is, quite simply, right. Storia di "Mamme in prima linea". "Mentre scrivo mio figlio dorme all'estremità opposta della stanza. E' vivo da ducentoquindici giorni. Abitiamo in un monolocale. Ha tre denti e due nomi..."
Bel romanzo che si legge in un soffio. Forse è piu' facile da comprendere per chi ha vissuto gli smarrimenti, le insonnie e il torpore di un neonato da accudire. "Deve forse menzionare le notti insonn Intreccio di vite. "Deve forse menzionare le notti insonni, ... le borse piene di cambi, pannolini e salviettine da preparare e da svuotare, la cicatrice sull'addome, in rilievo, ... la totale solitudine, ... il bisogno che prova a volte di fermare le donne piu' vecchie di lei per strada e domandare loro Come avete fatto? Come siete sopravvissute? O forse nessuno potrebbe dirgli che nessuno l'aveva preparata a quella cosa intensa che sente dentro, a quella sensazione che la parola "amore" non riesce a contenere del tutto, perchè è di gran lunga troppo piccola..."
Las 5 estrellas son por ocuparse de describir lo que supone el postparto. O'Farrell lo presenta tal y como es: duro, muy duro. Las preguntas que me surgen son: por qué en pleno siglo XXI el tema del parto, postparto y crianza de los hijos sigue relegándose al ámbito doméstico? Cuándo ocupará el espacio público que es el que le corresponde? Por qué se invisibiliza la sacudida física y emocional que supone tener un hijo? Por qué se esconde el agotamiento? Por qué no se habla del cambio que se expe Las 5 estrellas son por ocuparse de describir lo que supone el postparto. O'Farrell lo presenta tal y como es: duro, muy duro. Las preguntas que me surgen son: por qué en pleno siglo XXI el tema del parto, postparto y crianza de los hijos sigue relegándose al ámbito doméstico? Cuándo ocupará el espacio público que es el que le corresponde? Por qué se invisibiliza la sacudida física y emocional que supone tener un hijo? Por qué se esconde el agotamiento? Por qué no se habla del cambio que se experimenta como pareja, de los inexistentes espacios temporales disponibles solo para 2? Por qué hay tan pocas obras de ficción que hablen sobre ello? The prose in this book was so smooth. I sat and read for hours and it felt like minutes. I had no idea where this book was going, but I knew I wanted to be there. How in the world were these two women connected? I really couldn't imagine it. When everything finally came together, it was a great moment. This book was worth getting two less hours of sleep than usual. O'Farrell does a flawless job describing how it feels to be a first time mother, being in love with your tiny baby but having your h The prose in this book was so smooth. I sat and read for hours and it felt like minutes. I had no idea where this book was going, but I knew I wanted to be there. How in the world were these two women connected? I really couldn't imagine it. When everything finally came together, it was a great moment. This book was worth getting two less hours of sleep than usual. O'Farrell does a flawless job describing how it feels to be a first time mother, being in love with your tiny baby but having your husband/boyfriend go off to work, being inside and inside and inside the house with just a very little person who only sleeps for a few short hours at a time. I really felt like I was reliving that period in my life while I was reading about Elina. At the beginning of the book, I didn't like Lexie very much. I found her to be bratty and immature. But then she grew up a bit, and then a bit more, and it turned out that Innes wasn't what I thought he was either. By the end of the book I thought Lexie was the greatest. The Hand That First Held Mine is Maggie O’Farrell’s fifth novel. Two stories are told in parallel: Lexie Sinclair quits Devon for London when the charismatic Innes Kent arrives on her doorstep, and starts her life at the heart of the 1950s Soho art scene; Elina and Ted are coming to terms with the changes wrought in their present-day lives by the birth of their son. As we follow lives separated by fifty years, wondering how they might be connected, we learn that Ted has been having flashes of me The Hand That First Held Mine is Maggie O’Farrell’s fifth novel. Two stories are told in parallel: Lexie Sinclair quits Devon for London when the charismatic Innes Kent arrives on her doorstep, and starts her life at the heart of the 1950s Soho art scene; Elina and Ted are coming to terms with the changes wrought in their present-day lives by the birth of their son. As we follow lives separated by fifty years, wondering how they might be connected, we learn that Ted has been having flashes of memory of his childhood which seem at odds with his parents’ version. Two parallel stories: Lexie in the 60s and Elina in the present day. We see Lexie from the time she rebels against her country upbringing and heads to London to forge a career, fall in love (more than once) and meet the challenges of being a single mother. We see Elina (an artist from Finland, living with Ted in London) only after she has had her first child. It did not take me too long to guess the connections between the two stories but this did not detract from the novel's enjoyment. Maggie O Two parallel stories: Lexie in the 60s and Elina in the present day. We see Lexie from the time she rebels against her country upbringing and heads to London to forge a career, fall in love (more than once) and meet the challenges of being a single mother. We see Elina (an artist from Finland, living with Ted in London) only after she has had her first child. It did not take me too long to guess the connections between the two stories but this did not detract from the novel's enjoyment. Druga priča prati mladu obitelj s malim djetetom koja prolazi sve poteškoće roditeljstsva,u pozadini svega...jedna velika tajna koja će se polako otkrivati. Naizgled nepovezane,priče se na kraju spajaju,rješavajući zagonetku. A young yet successful artist immigrates to England from Finland, falls in love and has a baby with her English landlord. It's a difficult birth and both Elin and Ted are reeling from its aftermath. Elin feels alone and confused by Ted's isolating behavior. Ted is just as lost by his behavior. Seeing Elin almost bleed out after her C-section has triggered fear and old remembrances that he can't quite hold onto keep coming unburied yet he can't seem to hold onto the connections so he plunges even A young yet successful artist immigrates to England from Finland, falls in love and has a baby with her English landlord. It's a difficult birth and both Elin and Ted are reeling from its aftermath. Elin feels alone and confused by Ted's isolating behavior. Ted is just as lost by his behavior. Seeing Elin almost bleed out after her C-section has triggered fear and old remembrances that he can't quite hold onto keep coming unburied yet he can't seem to hold onto the connections so he plunges even more into his work leaving his partner and child on their own. The opening chapters were scintillating. There were shiny bits and surprises and odd juxtapositions everywhere. It kept me on the edge of my seat. This first couple, Lexie and Innes, are just as in love as Elin and Ted. Lexie and Innes are running a paper with other friends in the heart of Soho beginning in the 1950's. They are energized and you can sense the post war renewal of hope in these young people who live for jazz and avant-garde art and to share their passions about both. Sadly Innes, the WW II vet, is already married and has a child. Lexie can't resist him and unconventionally moves in with him. They have an idyllic few years together before the world crashes into their little flat and into paper their run. The adventure of this book is working out the relationship between the 1950/60's and the now. O'Farrell does this with a great deal of suspense. It's an enjoyable book. I have to mention the book cover artwork as well because it's so well done and relevant to the story. The outer jacket has a beautiful strawberry blonde with curling hair on a sheer green-blue background. Beneath that, embossed onto the book is a dark haired more solemn yet just as lovely woman set just in front of the blonde. Though it you can just make out the ghost of the dark haired woman. It's one of the best covers I've seen in awhile.